For Veterans: All veterans must fill out an application to be selected for a flight. This involves divulging certain personal and medical information, so we can make every effort to accommodate any special needs the veteran may have in order to make their flight a memorable experience. A VETERAN DOES NOT HAVE TO PROVIDE THEIR OWN GUARDIAN WHEN APPLYING…WE HAVE OVER 700 GUARDIAN APPLICATIONS ON FILE!! 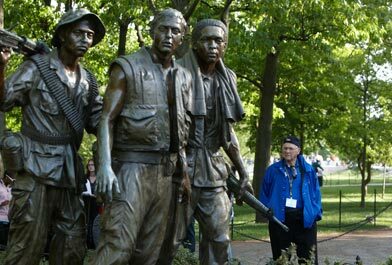 It is a National Honor Flight policy that ALL veterans are assigned a guardian, regardless of their health. The ratio of veterans to a guardian depends upon the veterans’ needs on each flight. SPOUSES OR SIGNIFICANT “OTHERS” CAN NOT BE YOUR GUARDIAN. NEW NEW NEW……ON-LINE APPLICATIONS FOR VETERANS & GUARDIANS. Once contacted (by postcard) that your application is on file with us you never have to fill out the same application again. For Guardians: Applicants between the ages of 18-69 can apply to be a guardian. Husbands, wives or “significant others” of veterans cannot be their guardians. If chosen, you will be required to pay the cost of the trip, which is $500 and attend a mandatory guardian training session. If you would like to apply to be a guardian, you may do so by downloading and filling out a form (below) OR fill out on-line application above. GUARDIANS DO NOT HAVE TO BE A VETERAN! If you are requesting to fly with a specific veteran, your application MUST be received PRIOR to the veteran being called to go on a specific flight, for your application to be considered. For Media: If you are a member of the media & would like to go on a future flight; the Media application is available below. For *Doctors: If you are a *Doctor & would like to apply as an Honor Flight “Medic”; the Doctor application is available below. For Volunteers: If you would like to volunteer for other duties, you may do so by downloading and filling out a form which is available below. Please print the application and mail to 4404 Rib Mountain Drive #234, Wausau, WI, 54401.